Sharp eyed viewers of the recent party political leaders' debate on the BBC may have remarked that one of the five paintings that provided the backdrop in Aberdeen University's grand Elphinstone Hall was noticeably brighter than the others: this was because it was cleaned and restored by The Conservation Studio in 2010, with a view to generating interest (and funds) to treat the others. Collectively known as the King's Paintings (also colloquially as the Black paintings, though this is clearly a remediable description) the most recent sholarship suggests they were executed as decoration for the chambers in Huntingtower Castle near Perth when the Ruthven nobles held King James VI prisoner in 1582 - the Biblical subjects all illustrate the dangers and errors of tyranny and urge humility on earthly Kings. The Conservation Studio would like to make clear that the radiant halo the cleaned painting seemed to impart to close-up views of Labour's Jim Murphy does not imply any endorsement on our part! Please click here to see a more detailed image. 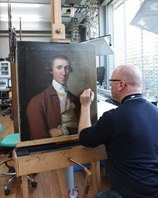 Owen has been working as a freelance contract conservator at National Galleries Scotland’s studios in recent weeks, conserving, cleaning and restoring a new acquisition for the Portrait Gallery. The portrait depicts David Scott (1746-1805), a Merchant & Director of the East India Company, and was painted by Tilly Kettle (1735 – 1786) who was the first English painter to work in India, and painted many portraits of British and Indian worthies. Sally recently recovered a 'lost' work by the Scottish Colourist F C B Cadell, which had been overpainted when the reverse of the canvas was re-used by the artist Denis Peploe, son of Cadell's fellow Colourist, S J Peploe. The work, although delicate and painstaking, was enormously satisfying. 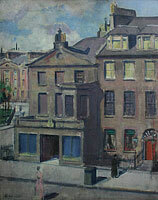 The painting, showing the west end of George Street in Edinburgh, with a partial view onto Charlotte Square, was painted from Cadell's studio window, at 112 George Street, and can be dated to circa 1909. 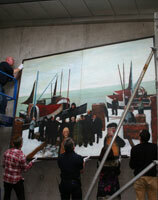 In November, a major work by the late John Bellany, 'Fishers In The Snow' was cleaned and restored by The Conservation Studio, before being re-installed in the cafe of the Scottish Parliament building. Measuring 2.4 x 3.2 metres, the logistics of moving the 1967 work were as challenging a part of the project as the conservation treatment. The Conservation Studio has restored a small panel painting from Blairs Museum, near Aberdeen, depicting a kneeling donor before an image of the Holy Trinity. 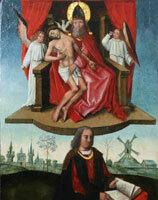 The composition of the Trinity group is derived from the Louvain altarpiece by Robert Campin, which was much imitated throughout Europe, and can also be found on the Trinity altarpiece by van der Goes at the Mound. Infra-red examination, kindly conducted by staff at the National Galleries Scotland, showed that the underdrawing of this group was clear and firm, whilst that on the kneeling figure was hesitant and much revised, suggesting the use of a pattern for the first, whilst the latter was drawn from life, perhaps by a less than confident artist. Dr. Lorne Campbell, ex-curator of the National Gallery in London, has identified the work as circa 1510, of a provincial school in the Flemish manner, and is strongly of the opinion that it may be a Scottish work. Since the reformation destroyed so much religious painting in Scotland, this small work represents a remarkable survival.